I have just completed my first Bohemian Skirt. 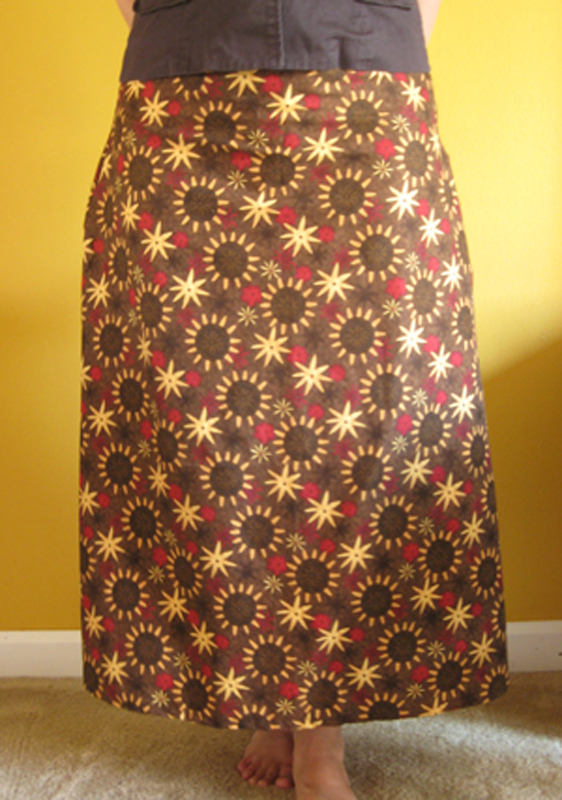 I loved this fabric so much I just knew it would make a fabulous skirt. First step is to get all your supplies together. You’ll need a tape measure, garment marking chalk, scissors, bobby pins, a sewing machine, fabric, liner, an iron and a zipper. After taking my measurements, I cut the fabric and the lining. Once the fabric was cut, it was off to the sewing machine to mend the front and back together. You’ll need to do this step for both the fabric and the lining. Leave enough room open on the side for the zipper. About 12-14 inches depending on the length of your zipper. At this stage it is a good idea to try on the piece to make sure it fits and the measurements were correct. It is much easier to tweak the fabric at this stage then when it is complete. Also you can now decide on the hem line depending on how long or short you want the skirt to be. Once that is measured out, you can sew the hem. ½ inch hem is all that is needed for the skirt. Here is a tip I learned first hand. 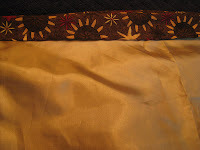 I thought I could get away with not hemming the lining because no one was going to see it, however, the first time I wore the skirt, the lining kept fraying and I had little strands of gold fabric following me around! So you may want to go ahead and hem the lining as well. Once the hem is measured and pinned, run a hot iron over the seam to keep it straight and then sew in place. 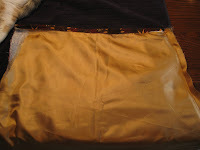 Next, attach the lining to the skirt. Turn the skirt inside out. Tuck it inside the lining which will be right side out. 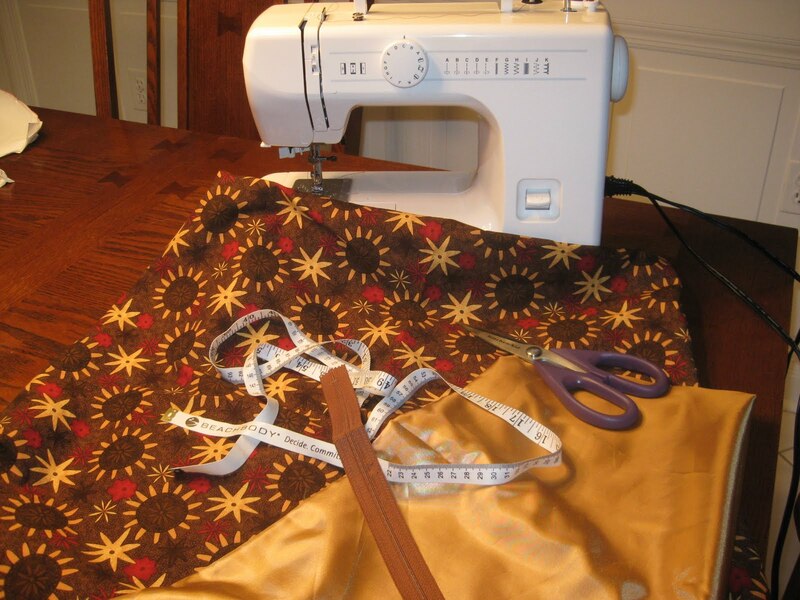 Fold the waist down over the lining about 1 inch, pin down, iron the seam and stitch it together. Last step is to attach the zipper. This is the tricky part. 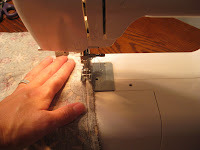 Start by first changing out the foot of your sewing machine to the zipper foot. Then place the zipper inside the skirt and pin down. Make sure to keep the zipper face up. You might want to hand baste the zipper in place. This makes it a little bit easier so the zipper does not move around and the fabric doesn’t get bunched up while going through the machine. I learned this one the hard way and had to rip out the zipper on my first try. 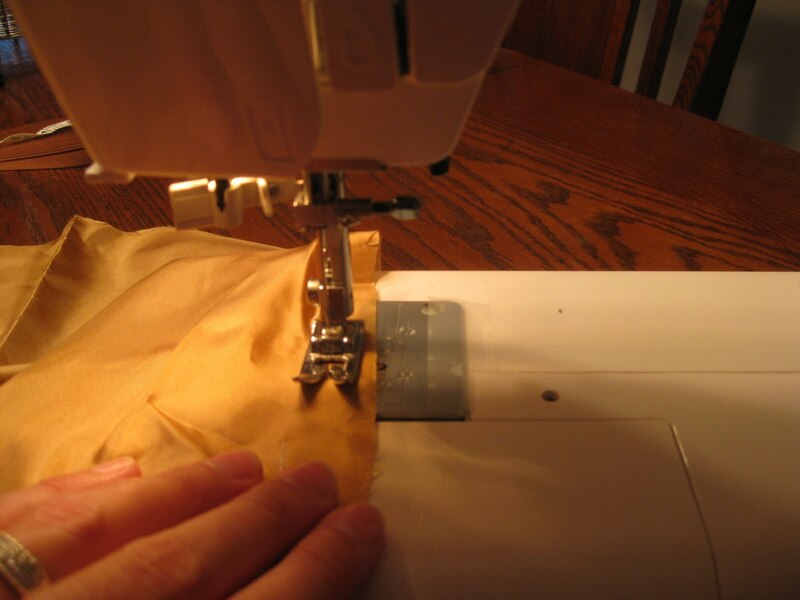 Sew down one side of the zipper, with needle in the fabric, lift the pressure foot, turn the fabric 1/4 turn, place the zipper foot back down and sew the bottom of the zipper straight across to the other side. Repeat process and turn the fabric another ¼ turn and sew up the other side of the zipper all the way up to the waistband. Sorry I forgot to take a photo of this step. VIOLA! You have just completed your skirt! Sewing takes a lot of patience but the end product is worth it. Sometimes, the best way to learn is to just go for it. Don’t be afraid to cut the fabric. Don’t be afraid to stitch something wrong. You can always rip it out and try again. Start off with something simple like a pillow or a skirt and work your way from there. Check your local fabric or craft stores for sewing classes or go to your local library to get books on beginner sewing projects. Have fun with it and soon you will be wearing all original pieces. Wow, you're quite the seamstress, that is a super cute skirt. Visiting from SITS and I'm so glad that I stopped by. Thanks Leigh! It is a great feeling of accomplishment every time I wear it. My next project is a wristlet so stay tuned! I love that skirt. What an awesome fabric. Can't wait to see what you make next. Thanks for the tutorial. I am zipper-phobic so I am hoping your tutorial will help me finish a dress I made last winter. Maybe I'll actually get a chance to wear it this winter, LOL! Have you ever made a dress? I am having trouble attaching the sleeves and was wondering if you had any tips? Thank you all for your comments. No Caren, sorry, I have not tackled sleeves yet but that could be a great winter project for me. So please keep reading! I really love the fabric! What a wonderful skirt for the fall! Wow, very impressed! It's adorable, good job. Love the fabric ... so fun! I'll admit it, all that measuring scares me but, the finished product seems worth it. I loved your pep talk at the end about just going for it. That's kind of how I get through everything. I will definitely be using your tutorial to take a stab at making a skirt. (I've always wanted to), and like you said, "Make it work!" I'm impressed. I have zero sewing skills! I also love the fall colors. That's a really pretty skirt. That came out really cute! I'm new to your blog and love it's concept. It's so up my sisters alley with the sewing and gardening! I'm sending her your way too. Happy creating! I really need to start using my sewing machine again! Your skirt turned out cute! I can't figure out how to follow you. Do you have GFC? Hello. 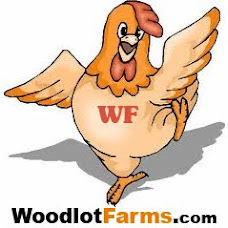 I'm a Modern Urban Homesteader located in Northern NJ about 20 miles west of the big apple. My blog is mostly about things I enjoy. Like reading, gardening, cooking, baking, crocheting and sewing. Thanks for visiting. Hope you enjoy it!